Brand Sony has done well with its Xperia series and with the Sony Xperia Tipo, Sony has brought out another excellent product. This device comes in a bar form and is run on the smart and futuristic Android V4.0 (Ice Cream Sandwich) OS. The operating software is backed up by an 800 MHz Qualcomm Scorpion processor and a 512 MB RAM which ensures that the multiple applications available on the phone run in a smooth and efficient manner. The display of this Sony Xperia is a 3.2-inch TFT Capacitive Touchscreen which provides an HVGA resolution of 320 x 480 pixels. The phone also comes packed with the Timescape user interface which serves to simplify the user’s interactivity with this device. The graphics on the screen are enhanced via the Adreno 200 graphics processing unit which provides a higher degree of display quality. The Sony Xperia Tipo comes packed with a 3.2 megapixel primary camera which doubles up as a video recorder as well. The camera features useful tools such as a 4x digital zoom, Self Timer and a Send to Web function which enhance the usability of the device. The phone also comes with a Geo-tagging feature which allows the user to add location based data to uploaded pictures or video. 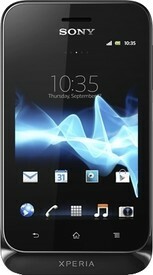 The Sony Xperia Tipo is a stylishly designed phone and features a rectangular look with sleek rounded edges. The phone weighs in at lithe 99.4 g and possesses dimensions of 57 x 103 x 13 mm which makes this device light as well as thin. The Sony Xperia Tipo also contains an accelerometer sensor which serves to rotate the screen depending on the orientation in which the device is held. The proximity sensor on the device switches off the display when the user is taking a call to prevent the user from tapping button unnecessarily. This Sony Xperia device comes with 2.5 GB internal memory as well as an expandable memory card slot which can increase the memory on the device by up to 32 GB using a micro SD card. The phone is powered by a 1500 mAh Li-Ion battery which promises the user a talktime of 5 hours when used on the 2G network. When used on the 3G network, the device promises the user a talktime of up to 4 hours. The Sony Xperia Tipo is capable of keeping the user connected to the internet from work, home or on the move. The phone features GPRS and EDGE technology which can keep the user connected to the internet via the 2G network. For a faster browsing experience on the move this phone also comes with 3G functionality. The user can also connect to a wireless network as the phone is WiFi capable. The Sony Xperia Tipo is also capable of tethering to another device via the USB port or the WiFi hotspot function in the device. Files and documents can be exchanged using the Bluetooth functionality or the USB port. Additionally, the phone is capable of serving as a navigation aid in the form of Google Maps which uses assisted-GPS support. The device features entertainment aid in the form of a music player, video player and an FM radio. Audio clarity from the device is enhanced via the inbuilt xLOUD Audio Filter Technology which improves the audio experience for the user.